Acid Bath Fans were excited to hear about a possible Acid Bath reunion, but it turns out the rumors were not true. The rumors were started when drummer, Jimmy Kyle posted a request for a new singer on his Facebook page. “In response to the post by ‘Acidbath The Bayou Kid’ on June 3rd, 2014, I’d like to clarify a few things: [Drummer] Jimmy Kyle created that post without prior discussion with [guitarist] Mike Sanchez or myself [guitarist, Sammy Duet]. 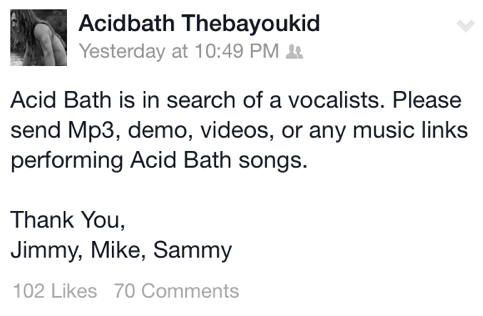 ACID BATH is not looking for a vocalist. There is no ACID BATH without [late bassist] Audie Pitre, so there will never be ‘new’ ACID BATH material. 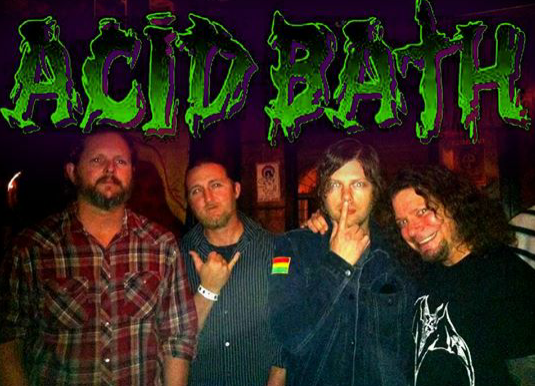 So there you have it, Acid Bath won’t be reuniting.